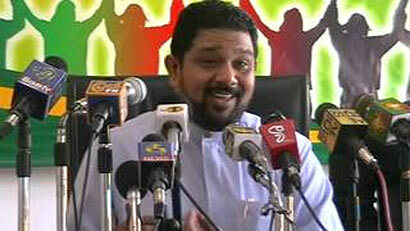 UNP Central Provincial Council member Azath Salley has decided to no longer support the UNP after criticising the party for the candidates it had nominated for the upcoming elections. Speaking at a press conference held today (February 12) in Colombo, Salley stated that the UNP had not nominated candidates for the Western and Southern PC elections who had any chance of winning. He claimed that he could no longer support a party that is continuously defeated. Please Don’t blame Mr.RANIL WICKRAMESINGHE . He is a Saint.This is the work of the newly appointed Leaders Council.Perhaps they are trying to undermine the excellent cohesive leadership qualities of their party leader.Get at the throats of Karu & Co. I disagree with Mr Sally. HE MR is unbeatable; his focus is on perpetuation of power and he is extremely superior at it. The current Cameron moves against his regime, in fact, are strengthening him, locally. At times, I tend to beleive that HE MR will not mind the division being sought by the International Mafia just because it will help hi strength in the South. Mr RW is lost cause; the UNP is an even greater lost cause; foul mouthed GF has never been a leader. There is a silver lining in the dark cloud; Ven Sobitha and the BBS could offer relief and progress towards a way forward.